Friday January 13th 1893 I was busy all forenoon with the housework. I gave the lamps a good cleaning. Soon after dinner Will and I went to call on Mrs McGovern. We stayed there till time to go over town to get things for supper. I found the girls had been here with Mother all the time I had been gone. Saturday January 14th 1893 I was busy with the baking and other work till noon. Mother did up the work and let me go to town. After doing my shopping I went down to call on Mrs Stump. I spent the time till Will called for me to come home. Weather very cold again. Sunday January 15th 1893 It was a very cold day I read what time I could spare from the house-work. Ott & Fanny were here a little while late in the afternoon. Monday January 16th 1893 Still very cold. We were all forenoon getting through with the wash. Lee helped us wash some in the afternoon. Josie came back but don't feel well. 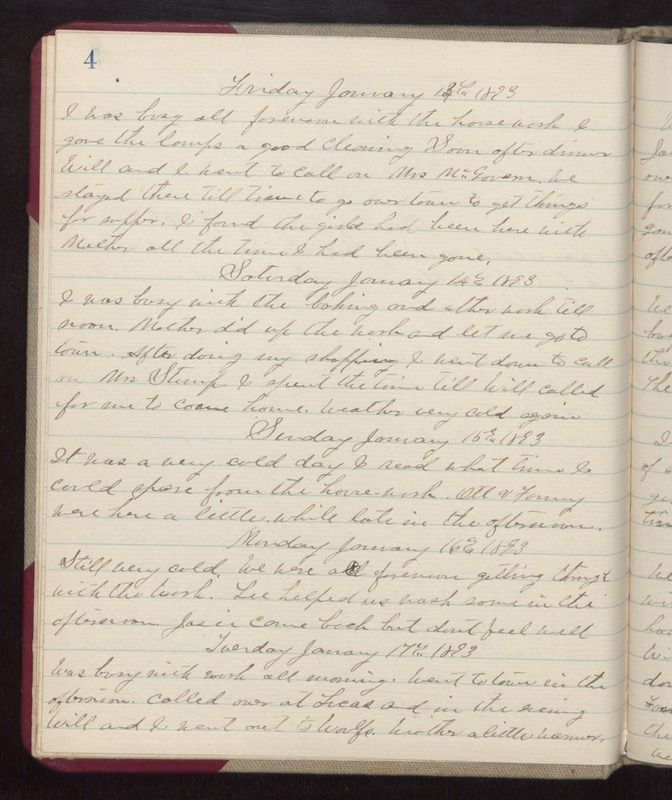 Tuesday January 17th 1893 Was busy with wash all morning. Went to town in the afternoon. Called over at Lees and in the evening Will and I went out to Woolfs. Weather a little warmer.